How do we go about promoting these experiences and understandings in our students? First of all I feel that our students are in programmes that are academically rigorous and based around inquiry or project-based learning. Perhaps this is easier to do in international schools, but I feel we are extending our classrooms beyond the physical walls of the school by engaging the students in the world around them and by using the resources of the places that they and their teachers have come from. Digital technologies and international mindedness are embedded into all areas of the curriculum. How can we do better? I think we need more emphasis on the arts, to promote creativity and self-expression. I think the teachers and administrators could probably do a better job of being engaged with each other in a process of continuous learning and that we could all do more to actively participate, innovate and support each other. Most important of all is transformational leadership which questions the way things have always been done, is open to discussion about the issues the community feels are important and inspires everyone in the community to embrace a shared vision and to change and move forward. I think everyone who knows me knows that I love jazz - so this analogy will certainly ring true. The nature of leadership has changed. We have gone from leaders who operate like the conductors of symphony orchestras (command and control with individual musicians playing as directed) to leaders who see their role more like that of a jazz ensemble: there is a main theme but the final piece is the result of improvisation and innovation by all the musicians. Most importantly of all the leader is not the only star on stage, but each person has a role in the spotlight to add to the development of the theme. A transformational leader provides the theme and the environment where the most inspired development can take place. 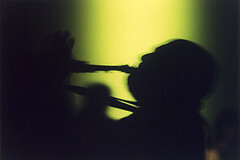 Dissonance, a lack of harmony, is important to jazz. It's important in schools too so that issues are brought out and discussed in an atmosphere of trust. Just as all the players in a jazz ensemble don't always know where the music will take them, the start of an inquiry can be hard for teachers as they don't know where the unit will go or where the students' questions will lead them. I was having lunch with one of our teachers today and having this very discussion. After a lot of difficulties in the first few planning meetings of the new unit of inquiry, today the team meeting was vibrant and productive with everyone contributing to the new direction the unit will take. This teacher later confided in me that she felt unsure with some of the science concepts. I told her it didn't really matter - she and her students could find out together as they experiment and explore what works and what doesn't. We talked about the fact that she didn't need to be able to answer all the students' questions upfront, that it was OK to just provide the environment for them to find out together and that if she merely answered their questions it may not lead to enduring understandings. Trying and failing and learning from this experience is what leads to true understanding. Creating the right climate for this to happen is the true role of a classroom leader. The inquiry approach that IB schools use open it to naturally flow into these "essentail capacities" in so many of the schools I work with, this list is a completely foreign concept. The schools are so centered around content mastery that there is little room left. The approach must change, we are not adequately preparing students in the ways we need to be. I like your additions of the creativitity and arts.